Save The Date: Destination Bermuda! Oh so tropical! 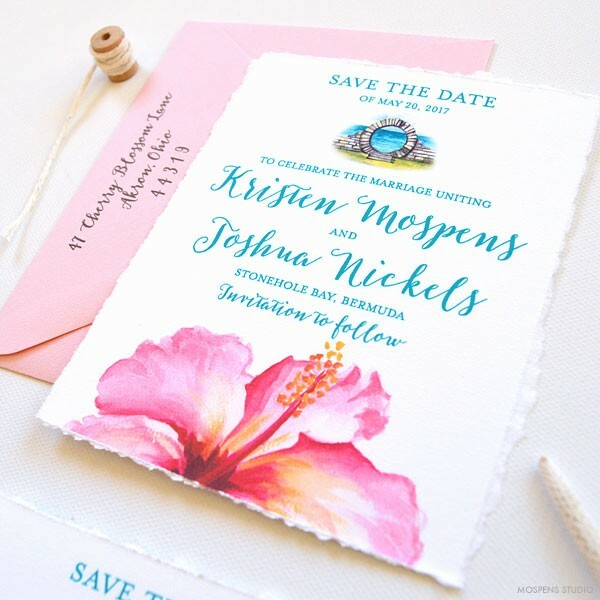 The Bermuda save the date design features hand-torn deckled edges, Bermuda moongate watercolor art, tropical pink hibiscus flower and beautiful turquoise blue text. We can’t decide if we love the soft pink envelopes or turquoise blue ones better! Save the dates for your wedding should be mailed out 6-9 months before your big day! If you are having a destination wedding or if your wedding date falls on or near a holiday, send out save the dates 1 year in advance. A true SIGNATURE favorite at Mospens Studio! One of our most popular beach wedding invitations the SHORE THING / SEASIDE STARS design. Beautiful Beach Wedding Invitations – The sea-worthy design features original art (of your choice), a hand-tied satin ribbon bow (in any one color), wave board, natural white starfish, tissue paper wrap, and invitation box. • Motif – Choose ANY art from my original watercolor artworks! • Fonts – Choose 1-2 fonts for your invite. • Ink Color – Choose 1-2 colors for your invitation design. • Ribbon – Choose one color you love! • Invitation Box – Choose between white, gold linen, silver, and country kraft. • Custom-made wave board – The wavy board is made just for us here at Mospens Studio! We currently have blue, gold metallic, white, and kraft. • Printing – At Mospens Studio, we offer letterpress, raised ink thermography, and flat ink digital full color printing. Letterpress is LUXE and very expensive. Raised ink thermography. Digital printing is our most affordable and most popular printing. • Tissue Paper – We can get almost any color you would like. Just let us know the color you would like or tell us your color scheme and we will help you choose the perfect color. • Starfish – We have natural white finger starfish, sugar starfish, knobby white starfish (shown above), and tan starfish. Handmade option: Some clients have us make the starfish by hand. Handmade starfish are costly due to the time involved. 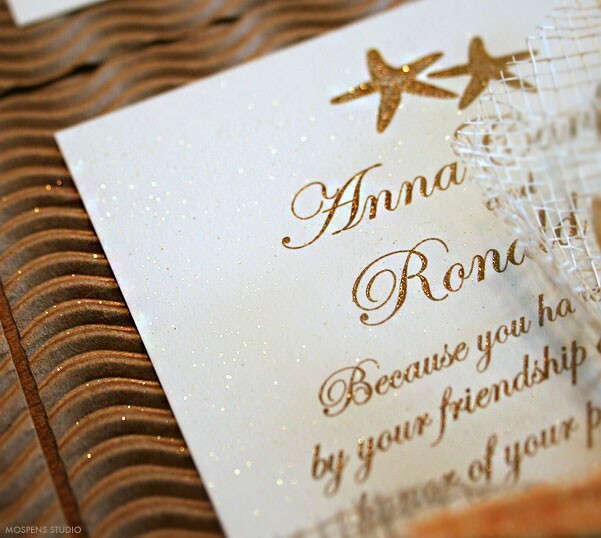 Shown above, gorgeous sparkly glitter gold SEASIDE STARS beach wedding invites. When ordering the starfish motif, just note SEASIDE STARS starfish. This design was sparkled with fine gold glitter. So beautiful! Just click link below to add to shopping basket, change quantity and click “recalculate” this will give you a quote quickly! White or buttercream personalized invitations with your choice of ink color, 1-2 fonts, and any one motif. Wave board backing layer adhered for you. Double satin ribbon wrapped and hand-tied into a knot. Starfish glued to knot. Tissue paper wrapped around invitation. Invitation nestled in invitation box. Reply card, mailing box or bubble envelope, mailing label, hand-paint each invite, add fine glitter sparkle to each invite, add stamp to each reply card envelope. Most clients have us add the reply card envelope stamps for them. Most times they will buy the mailing box and mailing label (with guest addressing and return address) also. If this is the case, we offer to put the boxed starfish invitation inside the separate mailing box for you with the reply card. This way once you receive, you just take the box to your local postmaster for quote and buy postage, then mail out. 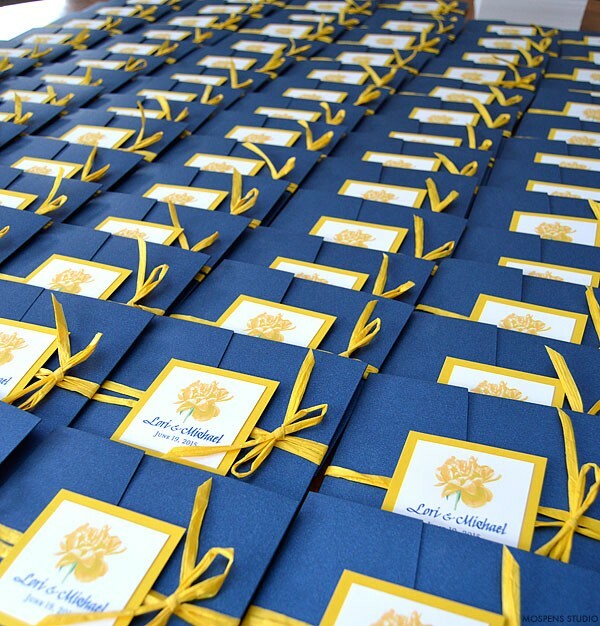 View more photos of our starfish invitations. So many custom designs in the works here at Mospens Studio! 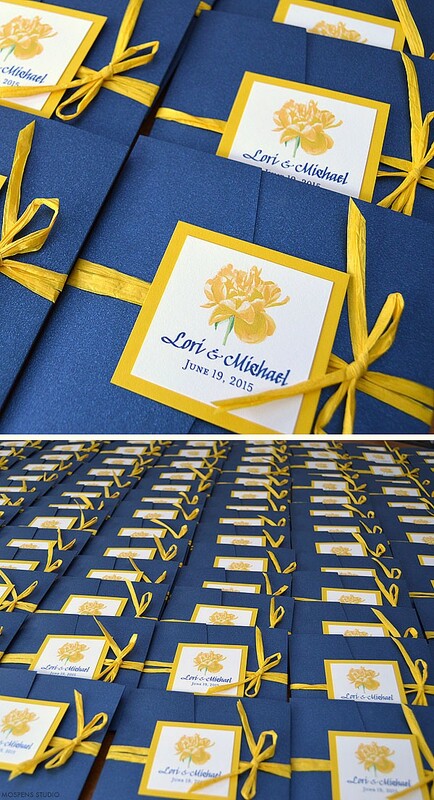 We LOVE Lori and Michael’s wedding invite design featuring original watercolor yellow peony flower art, sparkling navy blue pocket folder, layered invitation inside, personalized tab on front, and wrapped with a bright yellow hand tied bow. Watercolor wedding invitations are a signature favorite in our studio! Each invitation design is customized to match our clients colors. Yellow weddings are HOT this year! Find loads of yellow wedding ideas on Pinterest. Follow me there to capture inspiration for your wedding and celebrations. We are in LOVE with our clients tropical bottle wedding invitations for their wedding in beautiful Port Vila, Vanuatu. The first photo shown is our shop photo and the second is their actual order being worked on. Oh so tropical chic! At Mospens Studio, we have created our Signature TROPICAL MESSAGE bottle invitation since 2002. So far that is 13 years! We love offering MANY color and watercolor art options. So each client can personalize the look to your personal style. Our recent clients, Sarah and Steve, customized the bottle invitation with my plumeria watercolor art and light strawberry pink ink. Beautiful parchment paper with burnt edging James handcrafts in our studio. Each invitation is scrolled then inserted into the bottle. Each bottle invitation comes with a cork. Sarah and Steve upgraded their design to feature the handmade seashell necklace. The necklace arrive separate ready for them to wrap and hand tied then send out to each guest. Tropical beach weddings are one of the most popular destination wedding themes on Pinterest! Follow me there to capture inspiration for your wedding and celebrations.